﻿​﻿Racin' Flat Out for Christ takes you behind the scenes in NASCAR to show you what God is doing. You'll hear from 2011 Daytona 500 winner Trevor Bayne as he talks about the importance of getting his priorities straight before he won that race. You ll see how God used the outreach of the NASCAR community after a tornado in Texas to reach a soul for Christ. You'll learn about how close a group of drivers have become since getting involved in a Bible study together. And you'll read stories about what God is doing in the garage to change lives. But most of all, you ll be challenged to race flat out for Christ in your own life. 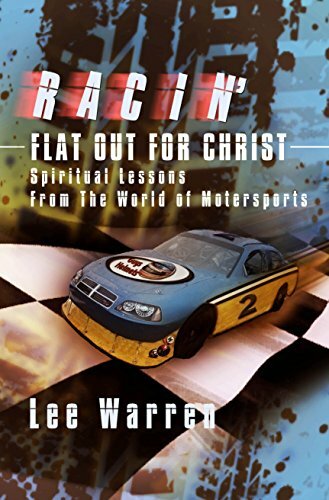 Lee Warren brings his love of NASCAR and experience as a sports reporter to this unique devotional book. Racin' Flat Out for Christ is a window into the world of National Association of Stock Car Racing, where risk, danger, and speed require courage and focus. He has covered this unique American sport for a variety of Christian publications. This slim paperback is a collection of spiritual lessons learned by NASCAR drivers who are driven by their faith, opening with Trevor Bayne, the unlikely surprise winner of the 2011 Daytona 500 in his second career NASCAR Sprint Cup start. In this devotional, Warren combines his reporter's instinct, his love for the sport, and his search for authentic Christianity amidst squealing tires and burnouts near the finish line. Racin' Flat Out for Christ is a very readable collection of short devotionals, accessible to both NASCAR fans and readers with little or no prior knowledge of this intense sport. Warren did not set out to gather stories that put NASCAR drivers and crew chiefs on a pedestal. Instead he frames each 400-word theme on how, in his own words, "... a holy God intervenes in the lives of, and often uses, imperfect people in the sport of NASCAR." Lee Warren's book, with 30 quick reads, could be used as a daily devotional, but it goes beyond the typical format of Bible verses and prompts to implement them in our own lives. Through stories of NASCAR drivers and their associates, Lee puts the reader in the mindset of a winner. Most of the drivers featured do not win races very often. Some are young and struggling; some are seasoned and struggling to succeed in an increasingly competitive, high pressure environment. However, as Lee demonstrates, they win when they stay focused on God and refuse to let anyone or anything else define them. Wisely, Lee begins the book with a disclaimer, noting that the people he spotlights are not perfect. We've seen many of their temper tantrums and other antics televised. The writer presents an honest picture of their ups and downs, and--without preaching--he shows that their walk with Christ is what ultimately keeps each one of them on track.